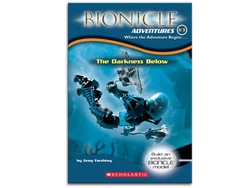 B337 BIONICLE Adventures 3: The Darkness Below is a BIONICLE Adventures book. The Toa Metru were ready to begin their trip to the Coliseum, weak and nearly powerless after the exhausting battle with the Morbuzakh, but stopped short at the border of Ta-Metru when the Matoran named Nuparu ran up to the Toa Metru. Whenua greeted him, and took him to the side so he could listen to what the Matoran had to say. Apparently, Nuparu had discovered a leak in the Maintenance Tunnels of the Onu-Metru Archives, and the sea could gush in. This was odd, because usually the miners reinforced the walls. Whenua talked with the other Toa Metru, and they decided to all go down and investigate. Whenua, having been an Archivist before, led them to a hidden shortcut by opening a hole in the road that led to the Archives, and the Maintenance Tunnels, which were nicknamed the 'Fikou Web.' Soon, however, they were attacked. A freak fog and the buzz of stinging Rahi led soon surrounded them, but Matau, using the little elemental power left to him, blew the fog away to reveal a Insect Control Rahkshi and a Weather Control Rahkshi. The Rahkshi challenged the Toa Metru, and the Toa began to attack them. An icy wind caused by Nuju caused the Weather Control Rahkshi to unleash a blizzard, but doing that also caused the insects to start to die, and the Insect Control Rahkshi attacked its brother. The Toa Metru used this opportunity to attack the Rahkshi, who then fled. After a small rest and talk, they proceeded, Whenua leading the way. Farther in the tunnels, a fork of six paths split them up, each going in a different tunnel to find the leak. But soon chaos erupted. Nokama was attacked by a Kraata-less Insect Control Rahkshi, Vakama blasted backwards by Nokama, Matau blown into a rock wall by Onewa with strange fire-powers, Onewa knocked down by Vakama, and Nuju running to assist Matau. They soon collided, battling each other. However, as Vakama was thrown between Nokama and Onewa's blasts, Nuju and Matau stopped Onewa, which led to their accusations. Realizing that Onewa said he hadn't seen Matau since they split, and the others saying that they had never attacked anybody, they stopped, wary and cautious. Whenua soon broke in, and heard what they were saying. Whenua told them that they had all been attacked by a fellow Toa Metru, yet not. A shape-shifter named Krahka, able to assume the voice, power, and look of anything she made visual contact with, was lurking there, and had attacked them all. They gingerly proceeded, Whenua holding a Lightstone in front. They soon came to a chasm, with nothing but a flimsy Le-Metru cable built across, and Stone Rats were swarming below that chasm. Whenua made his way across, then Nokama, and then Matau (walking across using his hands in a supreme show of arrogance). Vakama then began to proceed, but a ghostly, floating Density Rahkshi suddenly made an appearance and cut one end of the bridge. Vakama fell, and holding on. He realized the Stone Rats were beginning to climb up the bridge. He used a Weakening Kanoka Disk and jammed it into the bridge. Stone Rats, Vakama, and a severed bridge plunged down, and Vakama was only saved by Matau's insane courage. They flew through the ghostly Density Rahkshi, but it grabbed their leg and began pulling them down. Matau flew toward a wall, turned sharply, and the Density Rahkshi instantly shifted itself so it flew through the canyon wall and out of sight. They flew to the other side, leaving only Onewa and Nuju left. Nuju hesitated, but Onewa grabbed him suddenly, and jumped across the bridge, using his Proto Pitons to swing to the ledge. If Nuju had had any power left, he would have frozen Onewa then and there. Vakama stopped him, and Whenua, without any word, hurried onward. They traveled into a dark mist, and as Nokama and Whenua led in front, the Toa Metru began to disappear. Nokama hurriedly yelled for them, but Whenua insisted they go on. Turning on him, Nokama realized something, and stood in battle stance. She realized who Whenua really was: Krahka. Indeed, she was right. The Krahka shifted into various shapes and told Nokama of her hate of 'top-dwellers,' or Matoran. Krahka left Nokama with a silver Chain Lightning Rahkshi, a green-tan Illusion Rahkshi, and a black-white Cyclone Rahkshi. Using all of her cunning, wit and skill, Nokama took each one down, using her faded powers, intelligence, and a small leak. Nokama then went on to find the other Toa Metru, except for Whenua, stuck in some small crevices back in the cave they had disappeared in. However, Nuju was stuck in a strange stasis-field. They managed to get him out using a teleportation Disk, which teleported the stasis field, not Nuju. They hurried on, only met with a couple of Lava Eels which caused them some trouble, and then stopped to rest. Nuju volunteered to scout ahead, and as he did, found a chamber where Whenua was hanging upside down, and Nuju was trapped in a cage. He yelled to them, and then... Krahka reappeared. Vakama, Nokama and the other were starting to worry about Nuju. Vakama realized Krahka might set a trap if she had Nuju, so he had Matau hide. When Nuju got back, the Toa Metru told 'Nuju' that Matau had gone off to get help. 'Nuju' hurried to supposedly assist, but after Nokama got Nuju to say something that the normal Nuju knew wasn't true, Matau reappeared and pinned Krahka to the ground. Krahka just smiled, and transformed into a Lava Eel. The Toa Metru immediately let go, and had to follow her through the tunnels until she transformed once again. Wanting her to bring them to her lair, they started drilling into the wall, trying to make a tunnel out, which they knew Krahka wouldn't allow. And they did it loudly. Soon enough, clouds of strange, black smoke soon enveloped them and they were carried off to her lair. Dumped there, they saw Whenua hanging from the top of the cave, and Nuju in a small prison. Krahka told them they were going to stay in this room forever, and started sealing up the walls. The Toa Metru waited for a small while, formulating a plan, and then decided on something. Vakama grabbed a Kanoka disk from his pack, a Reconstitute at Random Disk, and launched it at Krahka. At the same time, Matau used some of his air power to launch himself up and grab Whenua, who had almost broken his bonds. Onewa and Nokama vaulted over to the stone cage of Nuju's like lightning, and freed Nuju quickly. Matau and Whenua had done a power dive toward Krahka, but she put up a wall of flames as Vakama. The real Vakama absorbed them, with what little will he had left, and then unleashed it at one of the entrances. Vakama yelled at the Krahka, calling her a thief, someone who stole other creatures might because she had none of her own. She just laughed, and transformed into a monstrous creature, a deadly combination of the six Toa Metru. She brought down the full might of their own elemental powers on the Toa Metru, who immediately spread out. However, Krahka's power was tiring her. Her mind had absorbed some of the memories of all of the Toa Metru, and they were mixing her up. In rage, she let loose a single beam which mixed all of their powers, forming solid Protodermis. Vakama began to stare in awe at this before pulled back by the others. They began to mess with her mind, telling her of her want for conquest, how she would end up driving all of the Rahi away, and she would be the absolute ruler of nothing. She began to expend large amounts of power quickly. Whenua began to attack and surprise her from underground. She collapsed, and Vakama, being closest, watched as she transformed into a Lava Eel and escaped once more. The other Toa Metru hurried over, asking him why he didn't just stop her. He simply said she was protecting her home, but in that power she was given, she became a monster... He saw inside her what the Toa Metru could become one day if they weren't careful... And then, exhausted but victorious, they left. This page uses content from BIONICLEsector01. The original article was at BIONICLE Adventures 3: The Darkness Below. The list of authors can be seen in the page history. As with Brickipedia, the text of BIONICLEsector01 is available under the GNU Free Documentation License, however please help to make this a unique article to Brickipedia in any way you can. Facts about "B337 BIONICLE Adventures 3: The Darkness Below"